Jimi Hendrix is next up on the video game Guitar Hero. 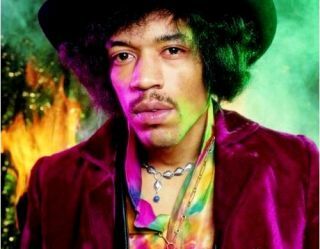 An avatar of Hendrix, as well as his ballad The Wind Cries Mary and a live version of Purple Haze (recorded in 1969), will be included on the game Guitar Hero World Tour. Gamers will be able to buy from Oct 27. It's no surprise, really, and was likely just a matter of time. There's no word yet whether gamers are required to play with their teeth or earn extra points for setting fire to the controller. It's the latest in a huge line of Jimi-related endorsements. You can officially buy everything from Jimi guitar straps to Jimi handbags. You could once buy official Jimi Hendrix red wine. But, given that he died from inhalation from vomit after taking sleeping pills and drinking red wine, that product was - perhaps wisely - withdrawn.